Are you feeling weak and dizzy? Getting breathless with little exertion? You may be suffering from anaemia. Anaemia is a condition in which the Hemoglobin (HbLevel) drops below a certain threshold, impairing the ability of the blood to carry sufficient oxygen to the tissues and the organs which need it. Why do Hb levels drop? Anaemia is a result of impaired production or excessive loss of RBCs. Sudden excessive blood loss due to any cause like trauma or surgery can lead to anaemia, but is easily corrected by replacing the lost volume. More common causes of anaemia due to blood loss are a result of more chronic and less severe bleeding like menstruation and gastro intestinal bleeding from ulcers and other diseases of the digestive tract. 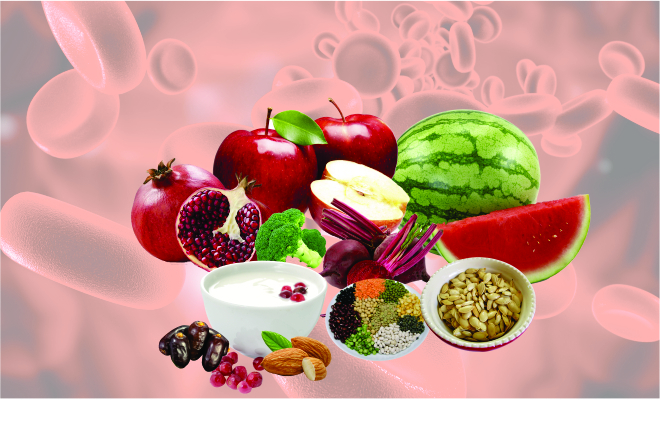 However, more often anaemia is a result of inadequate production of RBCs either due to nutritional deficiency of iron, folic acid, vitamin C, and vitamin B12, or less frequently due to diseases affecting the bone marrow (RBCs are produced in the bone marrow) like cancer, kidney problems, arthritis, diabetes etc. Apples: As the old saying goes “an apple a day keeps the doctor away”, it fits right here. Apples are rich in iron that is required for a healthy Hemoglobin count. Eating an apple with its skin is the most effective, but you can opt for its juice along with beetroot, ginger or lemon juice and drink it twice a day. Beetroots: Beetroots are high in iron, folic acid, fiber and potassium. Including it often in the diet helps to increase RBC count. Grate a beetroot and mix it with grated carrots, cabbage, onion, and tomato and eat it as a salad with olive oil or drink its juice once daily. Pomegranates: These are rich in iron, calcium, protein, carbohydrates and fiber. Pomegranates have vitamin A, C and E and contain three times as many antioxidants as that of green tea. Eat one medium sized pomegranate or one glass of juice with breakfast. Dates or dried dates: These are extremely nutritious. Along with iron, they contain potassium, calcium, magnesium, vitamin A, and B. And they are liked by kids too. Taking them regularly also boosts your energy levels. Water melon: It is available throughout the year and contains iron, carbohydrates, potassium, vitamin C and B. This fruit increases your Hb level and stamina without increasing fat. Green leafy vegetables: Green leafy vegetables are a great source of iron and calcium. Fenugreek (methi), spinach (palak), etc. should be a part of your daily diet. They can be cooked alone or mixed with lentils and other vegetables, or can be taken raw in salads or as soups. Legumes and lentils: All types of legumes are rich in iron. Including soya, black eyed peas, red kidney beans, etc. in your daily diet will gradually improve iron levels and help to energise you. Lentils like various daals, sesame seeds and grains like bajra, maize, semolina, etc. are also rich in iron, so they can also be included. Yogurt: Yogurt is rich in calcium and minerals. Regular intake of yogurt when combined with a balanced diet can prevent the decrease in the haemoglobin levels. Broccoli: It is a rich source of iron, vitamin C, minerals and other useful antioxidants. Pumpkin Seeds: Whether eaten as is, or added to salads; they are a rich source of iron, omega 3 fatty acids and zinc. Other Iron Rich Foods: Other sources of iron are red meat, shrimp, tofu, liver, certain fish, almonds, fortified cereals, etc. Vitality of Vitamin C: Just taking iron rich foods isn’t enough, it has to be absorbed by the body fully, and this is done with the help of vitamin C. This vitamin can be obtained from papaya, oranges, lemon, strawberries, bell peppers, broccoli, grapefruit, tomatoes, spinach, kiwi fruit, spearmint leaves, basil leaves, coriander leaves, bay leaf etc. Folic Acid and Vitamin B12: Low Hemoglobin levels can be caused due to folic acid and vitamin B12 deficiency as well. Liver, green leafy vegetables, wheat germ, fortified cereals, peanuts, bananas, broccoli are all good sources of folic acid. Exercise: Try to include exercise (aerobic exercise is recommended) in your daily routine. When you exercise, the body demands more oxygen throughout the body, encouraging the production of more Hemoglobin . ← Home BP Monitoring – Get it right?